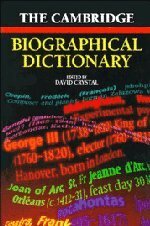 The Cambridge Biographical Dictionary is the outstanding paperback reference guide to the world's noted personalities, living and dead. From Aeschylus and Alexander the Great to Franco Zeffirelli and Louis Zukovsky, from Chinua Achebe and Larry Adler to Zhuangzi and Zoroasta, this alphabetical book provides the essential details on more than 14,000 people from the past and present some generally famous, others recognised within specialised fields throughout the arts, sciences and sport. By offering year of birth and (where appropriate) death, place of birth, profession, a succinct description of achievement, and in many cases pronunciations and cross-references to other personalities, the entries in this book amount to the most accurate and up-to-date compendium of world biography available in paperback.